The student-donated window seems to favor some of the Mondriaan/De Stijl elements of design. 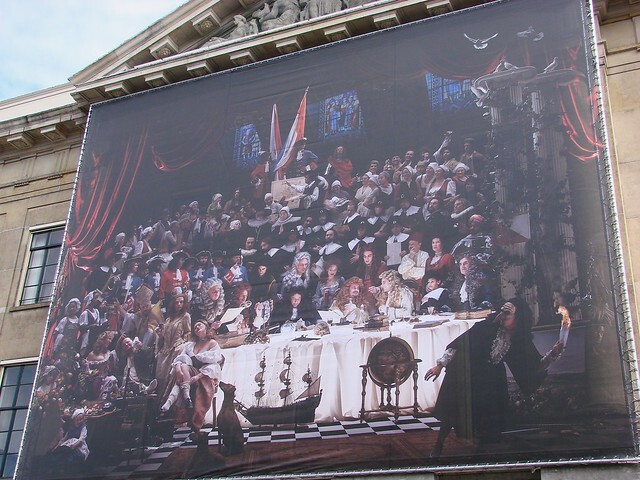 Last year, as part of the Treaty of Utrecht anniversary celebrations, a massive photo canvas was hung from the front of the Stadhuis, signifying the various parties involved in the historic agreement. The image was a composite of photos taken by artist Red Saunders, melded beautifully into a fascinating tableau. After the celebrations, there had been the hope that a place would be found where the image could hang on permanent display. Unfortunately, the sheer size meant that it just wasn’t feasible. It could have been folded up and left somewhere to gather dust, but an alternative solution was agreed upon. 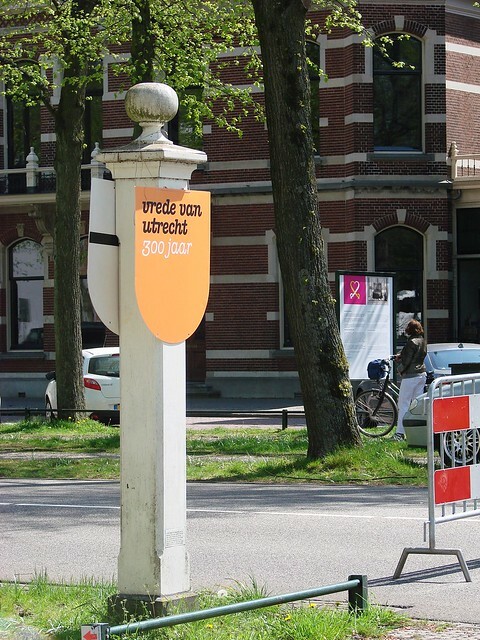 The variety of cultural festivals and events that take place here in Utrecht produce a number of sturdy banners that would become garbage if someone didn’t find an alternative use. As part of the duurzaamheid (sustainability) that is of growing interest, many of the old banners have been transformed into sturdy, unusual, and stylish bags. The people who have been doing this are going to do the same with The Agreement. Rather than have the large image languish in oblivion, it will be turned into a bag that can also be used as a picnic blanket, perfect for the Bevrijdingsfestival. Anyone interested can order one for just €20, and have their own personal and functional keepsake. Museums: Love ’em or Leave ’em? Graveyards for stuff. Tombs for inanimate things. Their cavernous rooms and deep corridors reverberate with the soft, dead sounds of tourists shuffling and employees yawning. They’re like libraries, without the party atmosphere. Occasionally a shrill voice bounces down from a distant hallway: “No photos!” and I swivel to see something, anything, that might be interesting. Leering at a censured tourist for kicks says more about my own desperate situation than it does his, and anyway, it could have been me. This is the beginning to an opinion piece that ran a little over a week ago, by a CNN senior travel producer. Titled, “Why I Hate Museums“, the piece complained about how boring museums are and how they should be more interactive and closer to the kinds of museums geared toward children. As an art historian of some sort (I have a degree and I even taught the topic.) I was particularly put off by what I saw as a childish, immature rant. The piece certainly caused quite a bit of discussion among art historians, although I think many, like myself, ultimately disagree with his statements. Can museums be full of dry facts and little background? Yes. Can they feel sterile and separate because of all the protective ropes and glass? Of course. But is it not better to keep these items protected for generations to come than to risk their decay and damage? I constantly regret the buildings, paintings, sculptures and more that I can only appreciate through old drawings, photographs (if I’m lucky), or simply descriptions in a worse case scenario, because they’ve been lost to history through destruction. Of course some artifacts speak for themselves. The Royal Armories in Leeds, England, shows off an 18th-century tunic on which you can still see the blood of the soldier who was speared, and presumably killed, while wearing it. A brief description suffices — imagination does the rest. He finds this tunic interesting and doesn’t think it needs much explanation, as if it’s an absolute truth that it should be appreciated by all. In truth, others may find it off-putting or simply not that exciting. My biggest issue with the article, though, is the way he talks about how exhibits should be more interactive, complaining of the “collect-and-cage policy”, yet he doesn’t seem to give any valid examples of alternatives. If you’re going to write a scathing piece about the pointlessness of museums today, at least offer some specific (and realistic) suggestions of what you want to see and experience. In truth, I suspect he’s over exaggerating much of what he writes, just to get a reaction (and page clicks). He’s following the path that much of modern media seems to be taking nowadays: style over substance. After all, CNN is hardly a paragon of virtue these days when it comes to accurate, informed reporting. The author seems to be advocating the same shallow demand to be entertained rather than truly informed. I also find it suspect that he hasn’t visited any museums that he’s found entertaining. 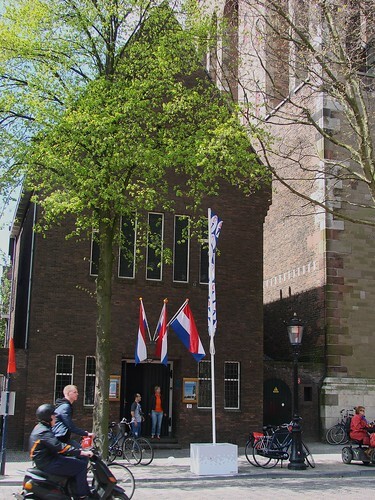 I truly doubt that Utrecht is that unique that we’ve cornered the market on interactive, entertaining museum exhibits. Sure, a recent visitor and travel writer to the city called it a “museum-lover’s paradise”, but I’m sure there are equally fascinating museums to be found around the world. She herself comments on the negative associations some people have with museums but also points out that the museums of today are different creatures. 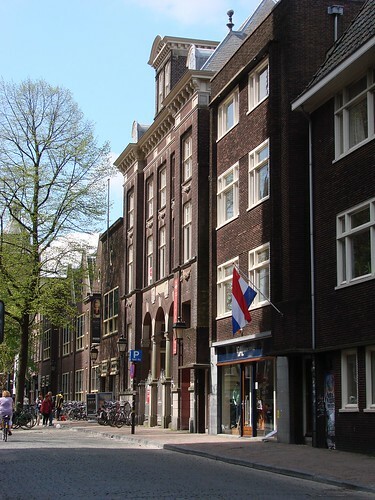 Appropriately, today marks the 175th anniversary of the opening of the Centraal Museum here in Utrecht. (FYI, there will be an official celebration on 22 September.) Surely, in the past 175 years, the museum has changed the way it exhibits its art and artifacts tremendously. I would argue that in many ways, the Centraal Museum may be the kind of museum that the CNN author says he wants. The museum, as winding and confusing as it can be sometimes — the result of being housed in a former cloister — still manages to create clearly defined exhibit areas. 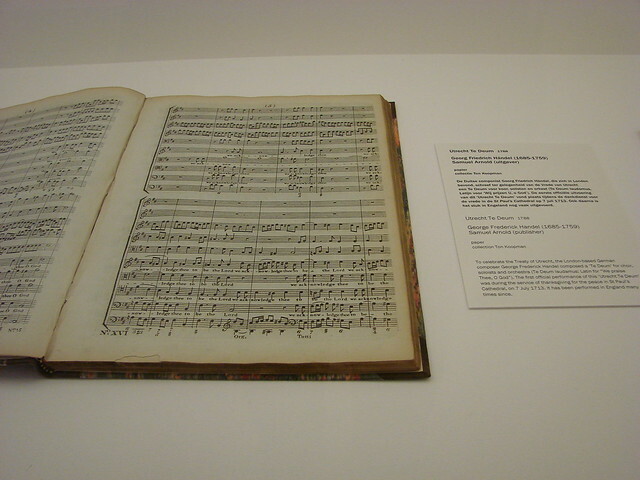 I’ve mentioned the new arrangement of Utrecht-related art, which groups pieces by decades and styles. As simple as it is, it really does do an excellent job of showing how Utrecht artists through the ages have developed, been influenced, and served as influence for others. 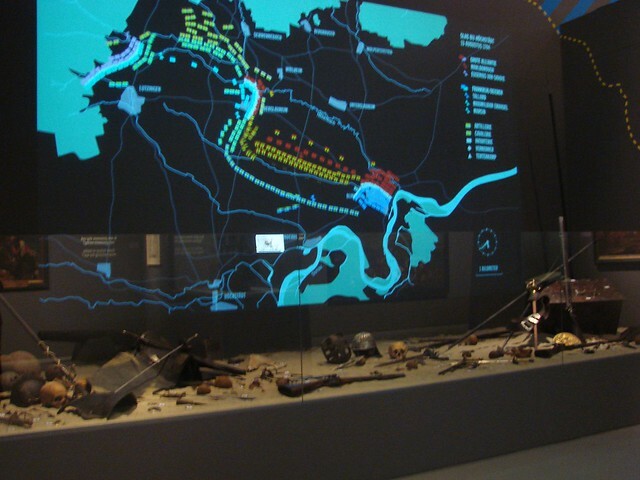 There’s also the 1000-year-old remains of a ship that I think of as the link between the two major exhibit areas. 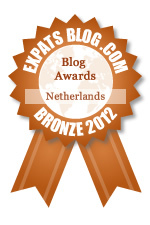 Interestingly, I realized on my last trip that even this simple (and smelly!) exhibit gets updated on occasion, with changing lights and sounds. Simple, but fun and fascinating! When it comes to the space for the larger, more frequently changed exhibits, that’s when things really get interesting. There are plenty of pieces behind glass or not to be touched, but there is also plenty of interaction and visual interest. 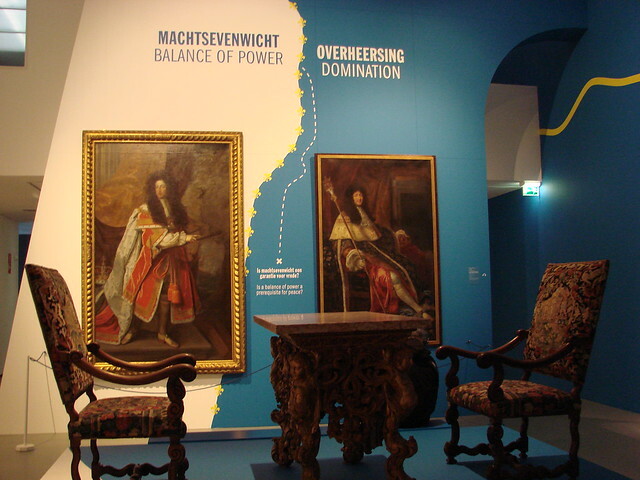 For example, the current exhibit about the history of the Treaty of Utrecht (which closes soon, so go now!) on its own actually isn’t completely my cup of tea. Much of it focuses on the War of Spanish Succession. While I find the history of the individuals involved interesting, and the machinations involved in finally agreeing on the series of treaties that brought an end to the war, the actual war aspects are not of particular interest to me. However, I know this about myself, so I’m less likely to go to a war museum in general. 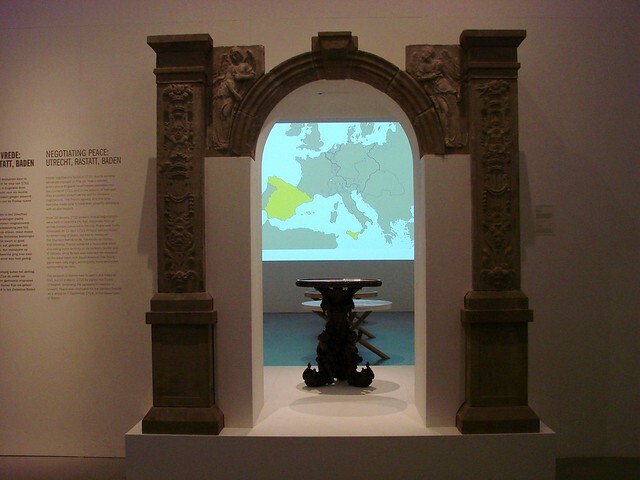 That said, there were still aspects of the exhibit that I found interesting. The walls themselves were covered in more than just the usual paintings. There were maps, quotes, and thought-provoking questions, which helped put each room into further perspective. 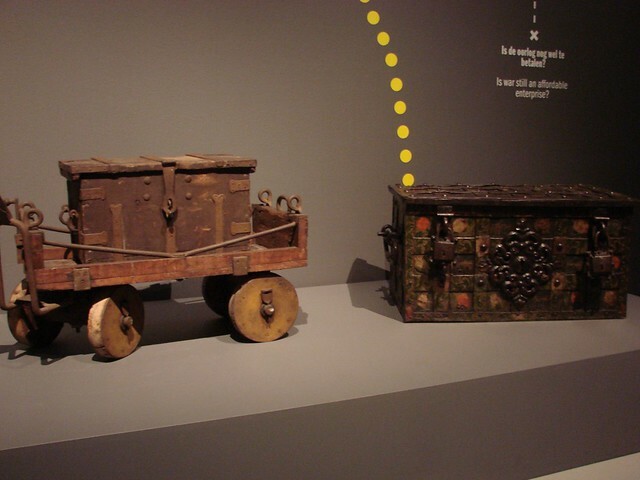 There were also pieces of furniture from Versailles and money chests from both Amsterdam and Utrecht (ours on the right is bigger and prettier). On top of all of that, there are spots throughout the exhibit where you can use an optional audio device to gain further information about aspects of history, individuals, etc. They’re more enjoyable than the traditional audio guided tour, because they complement the exhibit, rather than methodically take you through it. For the author who thought the blood-stained tunic stood on its own, there were plenty of weapons and other gruesome instruments and an electronic map charting various routes, formations, and shifting battle lines. There was even a child’s small coat of armor. At the end of the exhibit, there was even an interactive spot for both kids and adults. 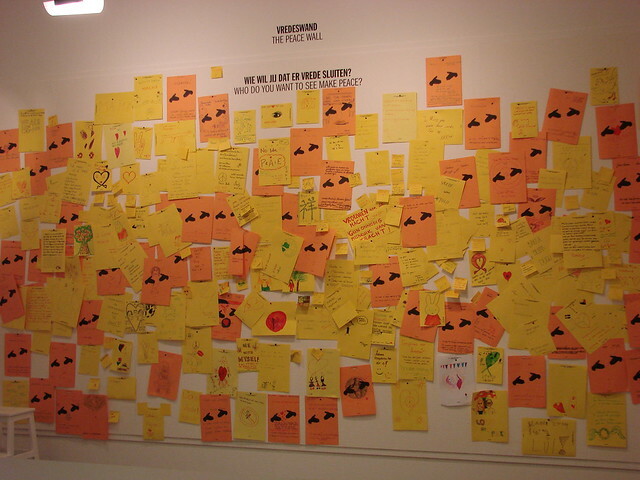 Whole walls were dedicated toward letting you write down your own ideas of where you’d like to see peace, with comments ranging from warring siblings to overall world peace. There were also actual games that could be played with two or more players. The point is that even for someone like me who isn’t overly interested in war history, I still found the exhibit interesting and worth the visit. This was hardly a unique exhibit, either. Similar steps were taken for past exhibits I’ve seen there. The larger the museum and the larger the number of tourists, the harder it may be to create the same sort of interactive involvement, but those museums also have the major works of art that people will happily flock to see, despite the crowds. Sure, I didn’t have the best view of the Birth of Venus, but I’m still happy I saw it in person. Not every museum is going to be exciting and not every person is going to enjoy even the best museums. Museums are trying to change and give visitors new experiences, but they also need to remain a place where both great works of art and smaller parts of our cultural history can remain in a safe, protected place. If you’re not a big fan of museums, try to find ones that actually showcase things that you find interesting. If you don’t like handbags, don’t go to the handbag museum in Amsterdam. Of course, you’re likely to be bored. If you prefer aviation to art, visit the Space and Aeronautics Museum rather than the National Gallery. The point is that with the wealth of information available online nowadays, there’s no excuse not to do a bit of research before you go to a new city, country, museum, etc. Find what appeals to you, but also try to keep an open mind. You never know what you may experience. If you’re a parent of young children, there are ways to help your child really enjoy the experience. 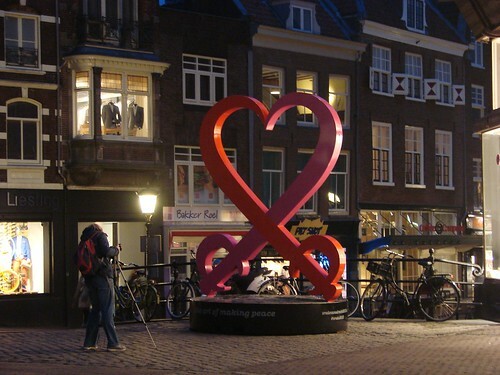 Try a scavenger hunt, like the author of Life in Dutch did with her little boy. To be honest, a scavenger hunt could be equally fun for adults and can be done for almost any museum with just a bit of imagination. Continuing the theme of giant public works of art, which I started with my post about the giant teapot, I figured I should finally post about The Agreement. 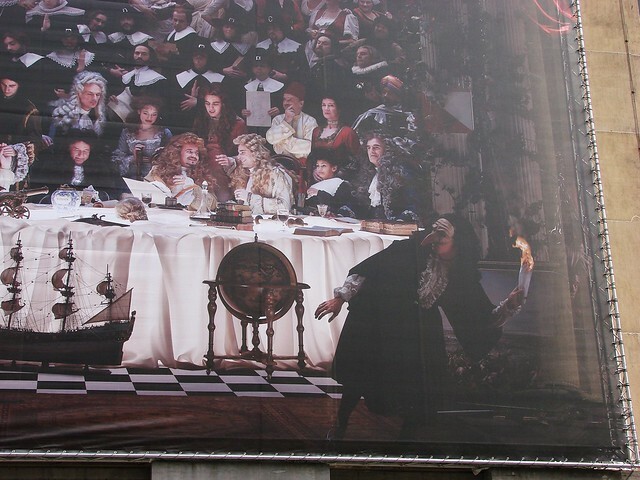 This 200-square-meter tableau hangs on the facade of the Stadhuis, the site where the Treaty of Utrecht was signed in 1713. It commemorates the event that brought an end to the War of Spanish Succession 300 years ago. 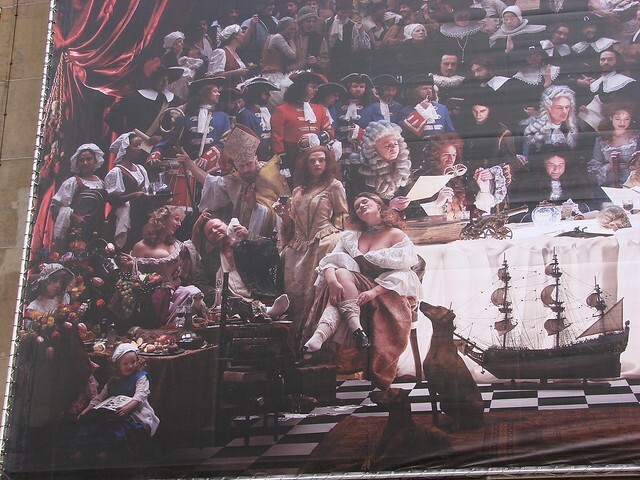 As part of the city-wide celebration taking place this year, this photographic mural was commissioned from an English photographer, Red Saunders. The final image is a combination of a series of photographs that have been morphed into one. Many of the people in the picture are volunteers. There was a request late last year for people who were interested in taking part. I briefly considered volunteering, but my lack of photogenic qualities deterred me. The negotiations for the treaty (actually a series of treaties) took 18 months and involved multiple countries and various groups, including diplomats, negotiators, aristocrats, Calvinist bureaucrats, militaries, and civil servants. 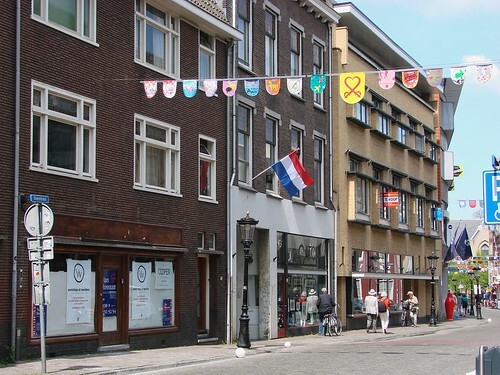 Not surprisingly, all of these various retinues were an economic boon for Utrecht, from bakers to prostitutes. 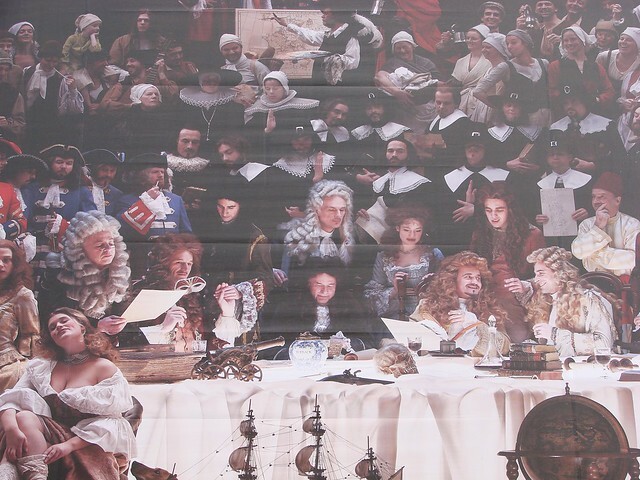 All of these groups and more are depicted in The Agreement, as well as a few visual nods to the Dutch Golden Age of art, trade, and commerce. There are ships, still life groupings, saints, and doves of peace to be found throughout the image. The Agreement is a great blend of history and humor. As well as the bawdy figures on the left, there is a curious masked figure on the bottom right. It seems that he’s a depiction of the inevitable spies who were involved in the drawn-out peace process. For a more extensive explanation of the various groupings and symbols, there’s a tagged description written by the photographer, which can be found here (in English). The following are a few photos that show a bit more detail. Finally, I recommend watching this relatively short video about the making of the picture. I had seen some of the video before the picture was revealed, and I found it fascinating to see how all the separate groupings were able to come together into one striking image. The Agreement will hang on the Stadhuis through 21 September 2013. 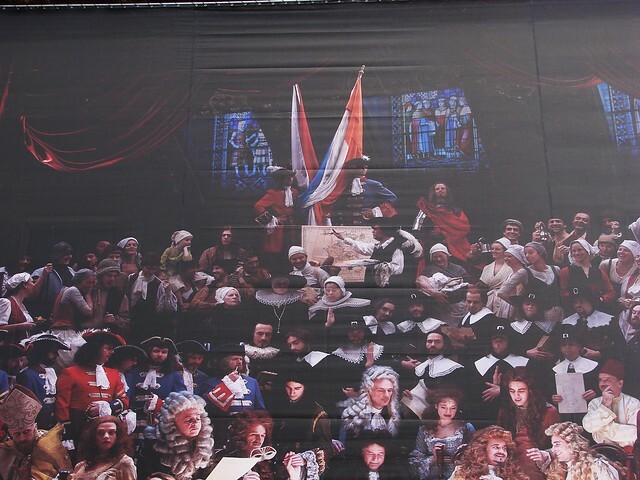 Although the 300th anniversary of the signing of the Treaty of Utrecht was in April, the celebrations continue. 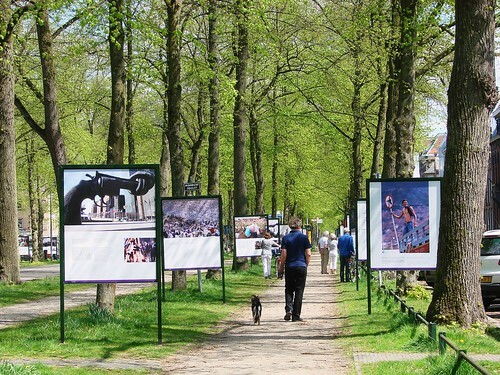 Recently, an outdoor photo exhibition was installed along the pathways of the Maliebaan. 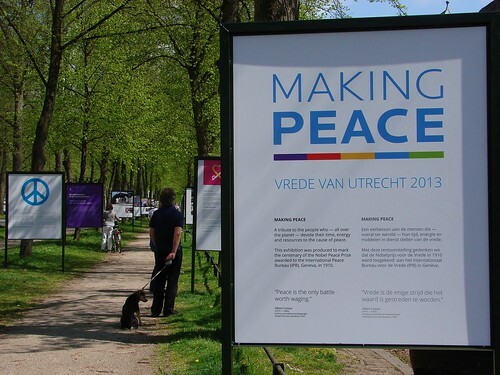 Titled “Making Peace”, it is an exhibit that shows the horrors of war, but gives hope through also focusing on the people and organizations that work to end war and promote peace. The international exhibition was first put on display along the shores of Lake Geneva in 2010, organized by the International Peace Bureau to celebrate their 100th anniversary of winning the Nobel Peace Prize. The exhibit includes photos from around the world, from some of the great photojournalists. A comment/explanation for each photo is provided in English and Dutch. Many of the photos are moving and thought-provoking. Some break your heart, while others provide a glimmer of hope. 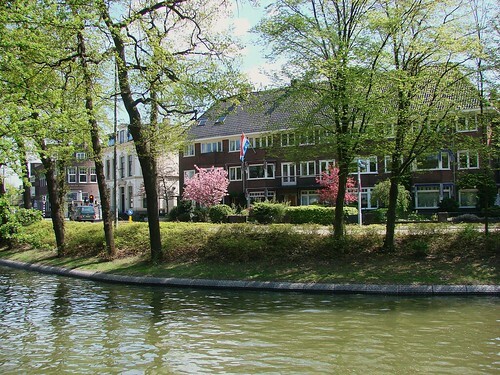 The Maliebaan is an historic avenue in Utrecht and now one of the most expensive streets in the city. Located just outside the old city center, it was opened in 1637 and features multiple lanes, separated by tunnels of trees. Some lanes are for vehicles, others for bicycles and pedestrians. In fact, the very first bicycle path built in the Netherlands was along the Maliebaan. The street has seen its own share of war and peace over the centuries, particularly during World War II, when the occupying Nazis had offices in the street. But it seems there were also resistance groups along the street, as well. 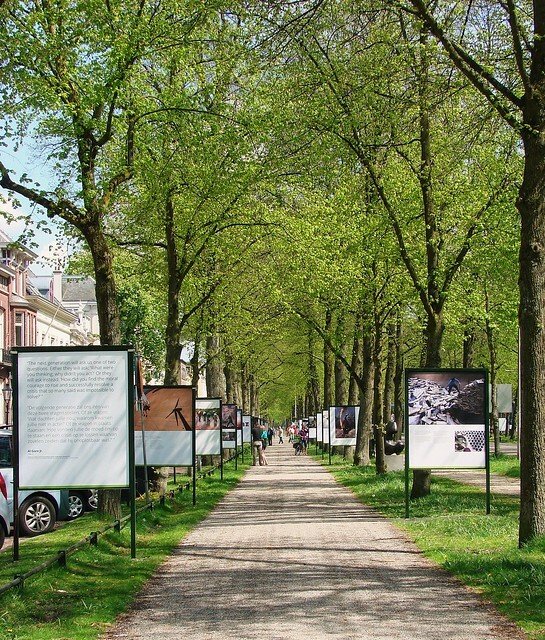 These pathways are a perfect setting for the photo exhibition. The street is relatively peaceful and allows time for contemplation of the numerous photos. The exhibit runs until 28 July and is definitely worth a visit. It’s been a week of important dates here in the Netherlands. First the last Queen’s Day, and now this weekend — May 4-5 — we’ve had Remembrance Day (Dodenherdenkingdag) and Liberation Day (Bevrijdingsdag). Remembrance Day (May 4) started as a day of remembrance for those killed during World War II, although now it’s generally a time to remember all who have died in conflict. 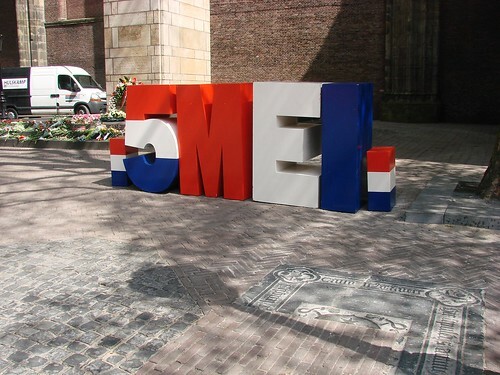 It is marked each year by special ceremonies and two minutes of silence at 8 p.m.
Remembrance Day is obviously a more somber day, whereas today, Liberation Day (May 5) commemorates the liberation of the Netherlands from the Nazis at the end of World War II. 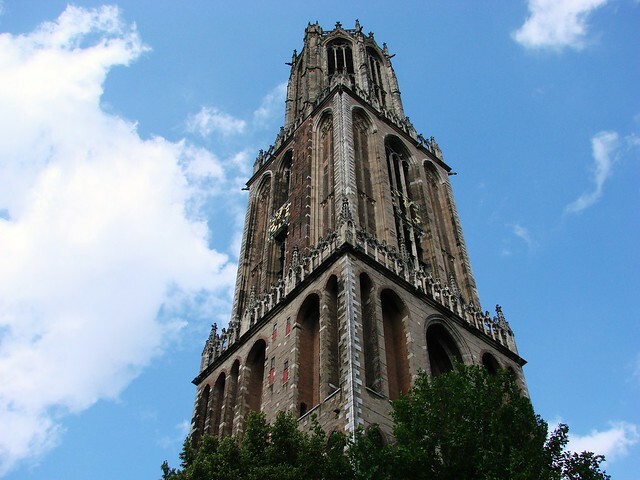 There are large festivals held in cities across the country and Utrecht is hosting a large one this year, in part due to the Vrede van Utrecht (Treaty of Utrect) ongoing celebrations. 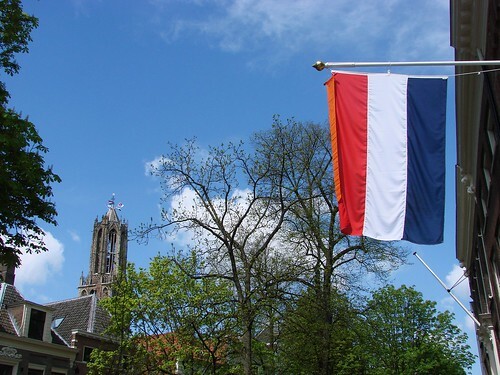 The Dutch flag instruction also stipulates on which days the flag should be flown. 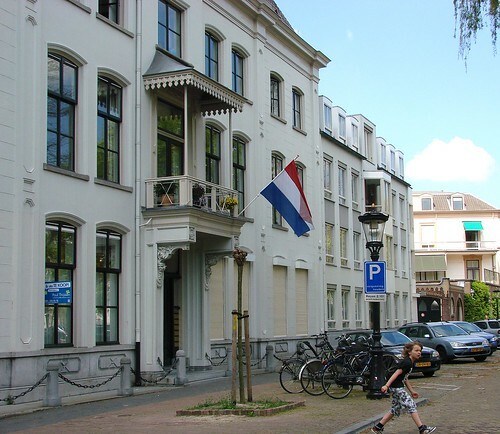 Of course this includes a selection of popular festivities such as Queen’s Day (soon to be King’s Day) and formal occasions such as Liberation Day, royal birthdays, Remembrance Day, Veterans Day, Victory in Europe Day and Koninkrijksdag (Kingdom Day). On these days, the flag may be hoisted from sunrise and must be taken down before sunset. 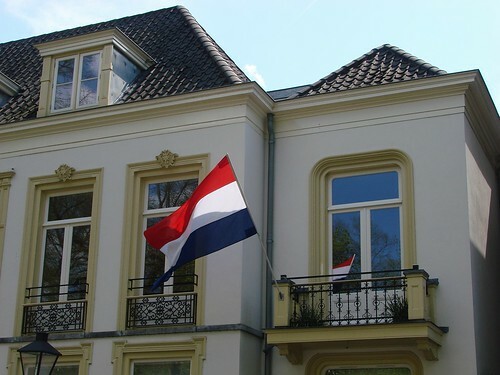 However, as the Dutch flag should never be flown on Sunday, if a celebration happens to fall on that day, the flag is raised the following Monday instead. 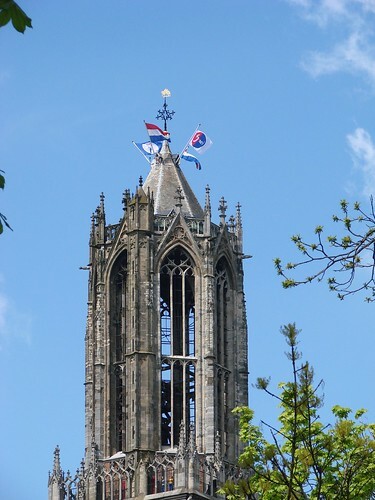 Considering the flags were flown on the Domtoren and the Domplein today — even while Prime Minister Rutte was visiting — I’m not sure how hard-and-fast some of those rules are. Anyway, I took a number of photos of the flags flying at various spots around town today. It’s a warm, beautiful day and a great day to celebrate freedom.